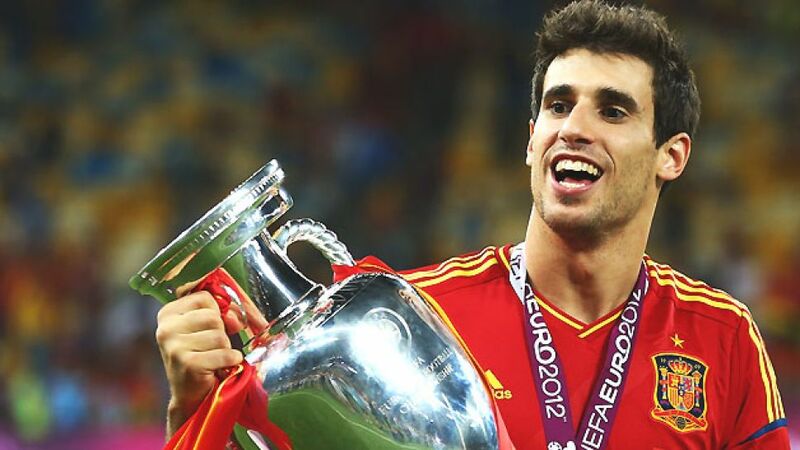 Javier "Javi" Martinez joined the international household names on the FC Bayern München books when he swapped La Liga and Bilbao's Athletic Club for the Bavarian capital, and a Bundesliga record fee, in the summer of 2012. At the end of a drawn-out transfer saga that rumbled on after Spain's victory at UEFA EURO 2012, Bayern chairman of the board Karl-Heinz Rummenigge spoke of his "delight" at having finally secured the services of the up-and-coming star. Having turned out for various local sides, Martinez joined the youth set-up at CA Osasuna back in 2005. Despite never appearing in the first team, his stock rose enough to attract an offer from Basque giants Athletic just a year later, and it was in Bilbao that he really made a name for himself. After making his senior bow in 2006, Martinez went on to establish himself as the heartbeat of the team while still a teenager, making 35 appearances in his first full campaign. Blessed with incredible stamina, superb tackling ability and an imposing physique, he soon matured into one of Spain's leading defensive midfielders. Martinez helped the club to the Spanish Cup final in 2009 and continued to progress steadily in an improving side who in 2011/12 impressed the whole of Europe with their flowing football. Bilbao even made it to the UEFA Europa League final, knocking out the likes of Manchester United FC and FC Schalke 04 along the way. Then Bayern came calling and he swiftly started repaying their faith in him during his debut season in Germany, helping the Bavarians to an unprecedented quadruple in 2012/13 and forming an instinctive understanding with Bastian Schweinsteiger in central midfield. He proved a guarantor for further silverware as the UEFA Super Cup - in which he scored an 120th-minute equaliser - and FIFA Club World Cup followed before the end of the calendar year and by the end of the 2013/14 campaign, was celebrating a second straight domestic league and cup double. The midfield powerhouse is now an established member of the Spanish national squad and after playing a bit part in their 2010 FIFA World Cup and UEFA EURO 2012 triumphs, as well as the 2014 FIFA World Cup in Brazil, Martinez looks set to figure more prominently for the Furia Roja from here on in.